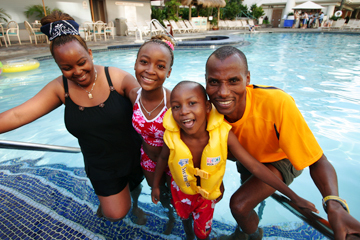 Reigning Honolulu Marathon champion Jimmy Muindi enjoyed the pool at the Outrigger Reef on the Beach with wife Lucy, daughter Stella and son Kevin this week. It could be an impersonal process, this crazy undertaking some see as mass masochism, the 26.2-mile tour into self-discovery and delayed ego gratification through pain called the marathon. B1 | How to recover, post-marathon. But even elite runners -- for whom this is a business -- have latched onto the ohana ideal of the Honolulu Marathon. Around 28,000 runners, joggers and walkers will begin the 33rd annual event at Ala Moana Beach Park tomorrow at 5 a.m., with wheelchair contestants starting a few minutes earlier. About 90 percent of them will finish, some in 2 hours, some in 10. Around 2 million cups, 70,000 sponges and 65 tons of ice will be consumed. Yes, the numbers are staggering, as are many of the runners as they hit 20 miles and 20 miles hit back. They share the pain, and they share the joy -- even the elite, like four-time champion Jimmy Muindi. And it's not like this at all marathons, according to the pros, who must be selective about the few they choose to enter each year. Konstantine Selenivich is the agent for the elite Russian runners. He said defending champion and course record-holder Lyubov Morgunova chooses Honolulu for reasons in addition to her illustrious achievements here. "I'm not saying she's sensitive, but when she feels people are taking care of her she runs better," Selenivich said. "Some others, and I won't say who, they don't really understand that. They just come to run the race. Sometimes they don't come back, and sometimes it's professional reasons. But it comes from the heart here." Winning helps, of course. Morgunova has broken the tape three times at Kapiolani Park, including a record 2:27:33 effort last year. Jimmy Muindi celebrated as he crossed the finish line last year to win his fourth Honolulu Marathon title. Muindi is also in a comfort zone here. He goes for Honolulu victory No. 5 tomorrow. With his course-record 2:11:12 in perfect conditions last year, he passed rival and three-time winner Mbarak Hussein for most victories. The favorites (with bib numbers) in tomorrow's 33rd Honolulu Marathon, which begins at 5 a.m. at Ala Moana Beach Park. Looking for fifth win here and third in row. Might not have peaked yet, even after breaking course record last year with 2:11:12 -- ran PR of 2:07.50 at Rotterdam. Always a contender here, ran 2:12:53 for 2nd in 2004. 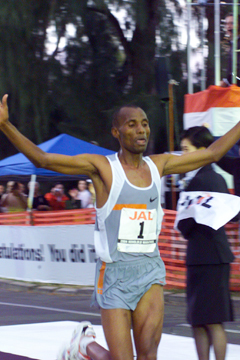 Best marathon is 2:12:11 at San Diego, 2003. Three-time Honolulu winner and former Kenya citizen dominating American masters ranks since naturalization this year. Can still bring it in marathon; PR of 2:06:49 was just last year at Berlin. Won Honolulu 10 years ago with 2:16:08. Recently, captured Loskop 50K in 2:44:03. His 2:07 at Fukuoka in 1997 is PR. Poised to challenge Muindi in Honolulu debut. Won Lake Biwa Mainichi with 2:09:00 in March. Ran PR of 2:06:49 at Berlin last year. Authored 2:10:34 (PR), second-place finish at Zurich in April. Makes Honolulu debut tomorrow. Did the job last year as pace-setter, helping big brother to course record. Now free to run for own glory. Makes marathon debut at advanced age. Ran 1:02:24 half-marathon (Japan, 1998). Came back from car accident to take third Honolulu win with course record 2:27:33 last year. Fashioned PR of 2:26:21 at London in 2000. Gaining respect as tough, talented competitor after proving 2003 win no fluke with PR 2:28:11 for 2nd last year despite nasty spill early in race. Hungry for Honolulu win after 3rd, 2nd and 4th past three years. PR is 2:29:05 at Nagano, 2003..
She and twin Olesya plan to challenge for win. Won Two Oceans 56K at Capetown in 3:38:12 in March. Olesya was second. Best marathon is 2:29:48 at Eurocity Frankfurt in 2004, with Elena on her heels at 2:29:49. Was 6th here in 2003 and last year. Authored PR of 2:28:47 at Osaka, 1998. Gradually, over the 13 times he has come here since 1993 (the first as the pacemaking "rabbit"), the personable Muindi has broken away from the pack off the course, too. To local people he is no longer just another world-class marathoner from Kenya. They know he's The Man, the Tiger Woods of this event, and Muindi reaquaints himself with many friends and signs plenty of autographs. "The course fits my style and I like the people and they like me," Muindi said. "They treat me well." It's business for him, but not all work. His wife and children are here, as they were two years ago. "My son's very active," Muindi said, as 6-year-old Kevin splashed around in the pool. "My daughter (11-year-old Stella) doesn't like to run, but she's very good in school." They weren't a distraction in 2003, when Muindi won in 2:12:59. Fox Sports running commentator Toni Reavis doubts they will be this time, either. "He's in great shape and in the last couple of years he's raised his game to a new level," Reavis said. "You don't want to look bad in front of the family." Reavis said Kenyans rarely bring loved ones to races. "That's a full embrace that this marathon is something close to his heart," Reavis said. "When you have that sort of feeling it shows up on race day. His personality is not just for walking around. This is his race." "If the weather is similar," he said. "I'm in better shape, and I believe I can ... if the weather, if it stays like this. Too much wind would be no good. Last year we had no wind. "The field this year is better, stronger." Fellow Kenyan Joseph Riri is close to Muindi in age, experience and credentials, but Riri is a Honolulu rookie. "(Muindi's) got more invested career-wise in Honolulu and I think psychologically when times get tough you can draw on that to make a separation," Reavis said. "Jimmy loaded it all up for Honolulu again." Muindi ran his lifetime best in April, winning the Rotterdam Marathon in 2:07:49. He pulled out of the World Championships in Helsinki in August with shin splints. "The turns bothered him," advisor Zane Branson said, noting that the course consisted of a 10-kilometer loop. National demographics dominate the Honolulu Marathon -- Kenyans, Russians and Japanese. Men from Kenya have won it nine straight years and Russian women six of the last nine. And entrants and finishers from Japan (15,723 and 14,706) outnumbered those from other countries combined last year. Two years ago, Eri Hayakawa broke out of the stereotype of Japanese runners merely being here on vacation. The unknown 21-year-old became the first Japanese of either gender to win Honolulu, completing the course in 2:31:57 after a hard charge up Diamond Head near the end of the race. "Russians, Russians, Russians," Reavis said, when asked to handicap the women's race. "And, I guess, Eri Hayakawa. "Morgunova's the course record-holder, defending champion," he added. "There's something about being the defending champion. You'll hurt a little more. You'll train a little harder coming in." And you might feel like you're at home. Even if you're Kenyan or Russian.